It’s bound to happen sooner or later; in the middle of a fight, in the middle of chopping down a tree, a little yellow debuff pops up on the screen – your gear is suffering damage. Or worse, it’s the red debuff, which indicates heavy gear damage. The regular gear damage debuff is bad enough – it means less damage done, and less damage absorbed. Heavy gear damage is more of the same, with a big hit to earned XP as well. There’s no way to avoid gear damage; it’s very much a part of FFXIV. Wear occurs to gear with every action taken. 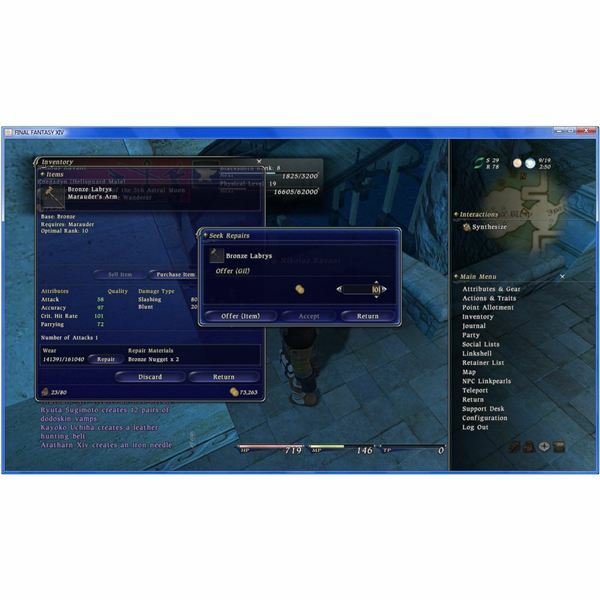 The important question is how to deal with it: How do you repair in FFXIV? The quickest route to FFXIV repair is to use an NPC. In every city, there is a vendor that can do simple gear repairs. In Limsa Lominsa, his name is Braitognieux and he can be found in West Hawker’s Alley. In Gridania the repair NPC is named Meara and can be found in the Ebony Stalls. In Ul’dah the repair NPC is named Gogorano and is located to one side of the Gate of Nald. Talking to one of these vendors opens a dialog with several options. For simple repairs, choose the first – "Have an item repaired." From there, a specific item can be chosen, or all equipped items. He or she can only repair equipped items. Items can only be repaired to 75%. This is enough to get rid of the gear damage debuff, but it does not repair gear to full. Having the NPC repair gear is also, ultimately, very expensive. Repairs can easily cost thousands of gil per item. The NPC has a few other menu options – one is to describe how to repair, which is a brief tutorial on how to do it manually. The other ("Perform your own repairs") allows you to use the craft facilities. To get an item to 100%, it must be repaired by a PC. If you have the correct crafting skill and equipment, you can do it yourself – otherwise, there’s a way to put an item up for repair by other PCs. First, unequip the item. On the item information screen, how much wear the item has is shown, as well as what materials are necessary to do repairs. To repair your own item, hit the "repair" button down by the list of repair materials. This will only work if you have the right crafting implements equipped beforehand. A menu much like the normal synthesis menu pops up; the repair materials must be manually populated from inventory. From there, synthesis proceeds as normal. If you are unable to repair the item, you can choose "seek repairs" instead – but first make sure there is an empty slot in your bazaar. 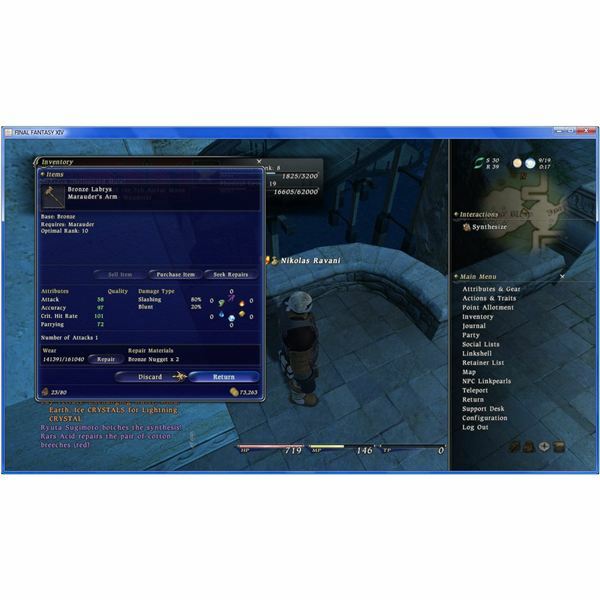 This will bring up a second window, which allows the input of an amount of gil, as well as inventory items. The gil and items are the amount you are willing to pay for the repair. it might not hurt to put items that cover the repair items necessary in the offer, though otherwise those can be included in the offered price. Once that dialog is completed, the item goes into your bazaar. After that it’s just a matter of waiting and hoping that a craftsman will come by and decide to take the offer.The bad news is, until that happens you will not be able to re-equip the item. In FFXIV repair is not as simple as some would like, but ultimately gives craftsmen a vital role in the lives of all players.